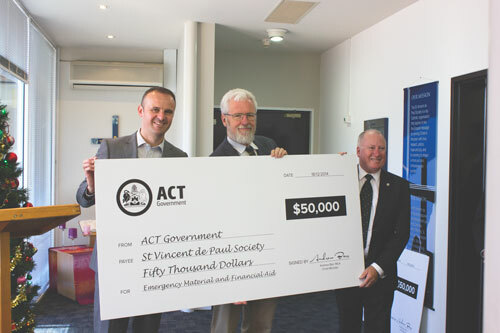 This Christmas the St Vincent de Paul Society Canberra/Goulburn received a very special Christmas gift from the ACT Government – an extra $50,000 to go towards our ACT emergency relief programs. On Thursday 18 December, Chief Minister Andrew Barr along with ACT Minister for Community Services Mick Gentleman MLA visited the Vinnies Deakin offices to announce a $150,000 grant to St Vincent de Paul, the Salvation Army and Uniting Care, Kippax to help them meet the needs of struggling Canberrans during this time of the year. The Chief Minister spoke to the importance of emergency relief funding in times of hardship and praised Vinnies for the important work we do to help those who are doing it tough. Following the presentation of the cheques, the Chief Minister and Minister Gentleman were given a tour of the Vinnies offices. Anthony O’Connell provided them with an insight into the work of the Helpline and Shannon Pickles and Sarah Clifton spoke about Vinnies’ Youth and Special Works programs. Both Ministers seemed impressed with the work Vinnies does and stayed for refreshments while engaging with staff and volunteers to find out what motivates people to be part of the Society. The additional $50,000 the Society received from the ACT Government comes in at a critical time of the year and will enable our Conferences to assist those in need during this time of high demand. You can also read the Canberra Times report on the announcement.